The world population is set to reach 10 billion by 2050, leading many to ask: will we have enough food to feed everyone? Feeding the world is just one of many challenges Sanchez addresses in the new second edition of his seminal textbook, Properties and Management of Soils in the Tropics, regarded by many as the “bible” for understanding and improving agriculture in Tropical Asia, Latin America and Africa. 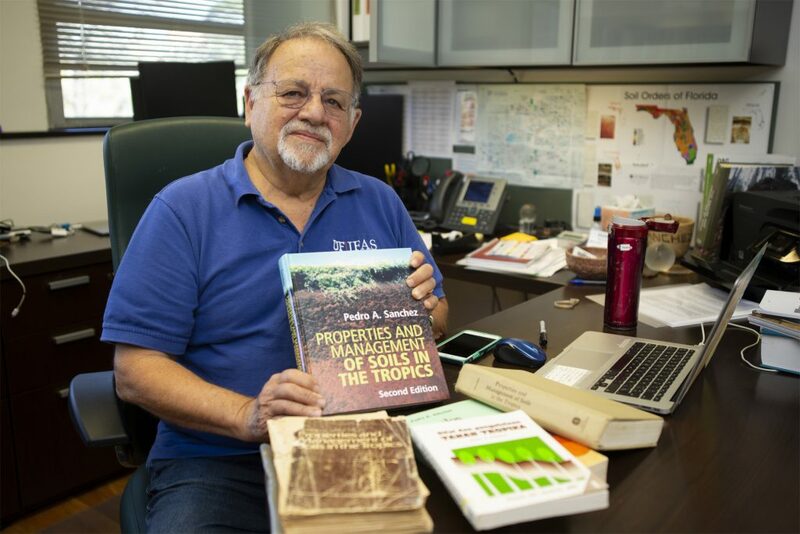 Dr. Pedro Sanchez with his new textbook Properties and Management of Soils in the Tropics. The book is geared toward any who practice soil science in the tropics, including students, researchers, extension workers and government workers. Sanchez describes the update of the original text as “soils plus” because it goes beyond the chemical equations and soil classification charts typical of most textbooks on the topic. The second edition, published by Cambridge University Press, tackles global issues, such as climate change, slash and burn agriculture, organic farming and fertilizer use. That expanded view is critical for understanding farming in the tropics, where geopolitical and economic factors impact a farmer’s ability to use his or her land to its potential, he said. “A big difference between farming in the tropics and farming in temperate regions, such as the U.S. or Europe, is policy and infrastructure: access to markets, access to seed, agricultural knowledge and services,” Sanchez said. Historically, farmers in tropics have not been able to produce as much food per hectare—about 2.5 acres—as their counterparts in other parts of the world, he added, which is why specific recommendations for the region are needed. “In Africa, the average cereal crop yield is one metric ton per hectare. In South America and Southeast Asia, it’s about 3 tons per hectare. In China, it’s at 6 tons, and in North America, Europe and Japan, it’s above 10. So there is a huge difference in capacity of production,” Sanchez said. The first edition of Properties and Management of Soils was published in 1976. Sanchez was inspired to write the text after working as a doctoral student in the Philippines. “I found that the Filipino students could not relate to soil issues you find with corn and soybeans grown in the Midwest of the United States, when their main crops were coconuts and flooded rice. So, it just hit me that they needed a more tropically oriented textbook,” Sanchez said. Between the first and second editions, Sanchez became one of the foremost experts on tropical soil science. Prior to joining UF, Sanchez was director of the Agriculture and Food Security Center and Senior Research Scholar at Columbia University’s Earth Institute. Before that, he served as director general of the World Agroforestry Center headquartered in Nairobi, Kenya, as co-chair of the United Nations Millennium Project Hunger Task Force, as director of the Millennium Villages Project, and, before that, as professor at North Carolina State University managing a Tropical Soils Program for 23 years. Sanchez is a World Food Prize laureate, a MacArthur Fellow, and was elected to the U.S. National Academy of Sciences in 2012. He has lived in Cuba, the Philippines, Peru, Colombia and Kenya, and supervised research programs in over 25 countries of Latin America, Southeast Asia and Africa.